The format is simple: beer, conversation, and God. Come bring your questions, bring a friend, and pull up a chair. Be ready to engage with people of varying religious traditions, philosophical perspectives and life experiences. You’ll be able to share your own wrestlings and thoughts while learning something new along the way, and hey— there’s likely to be a good craft beer you haven’t tried yet! OFFICIAL DIRECTORY: Listing of gatherings across the country here. Find us on Facebook and join the conversation online! Bryan is currently facilitating Pub Theology gatherings in Holland, Michigan on Monday evenings. Find resources to start your own group here. I need to come down, been seeing it advertised but never got around to it. Sounds like an interesting evening! This makes me miss living in Michigan! Cheers from Texas. Come to The Woodlands @ Hop Scholar on Rayford Road every Tuesday @ 6:30…for drink & dialogue. I’ve just finished reading your book ‘Pub Theology.’ Thanks for being willing to put your thoughts and practices down on paper and getting them published. I was greatly challenged and am now about to begin a similar group with a small number of people who are just hanging on to the periphery of the small church where I pastor in Scotland. Thank you once again for your encouraging and timely book. So glad to hear it! Great you were able to find a copy in Scotland. All the best as you venture into good and important conversations! Cheers from Kansas City! Great post on Huff Po! 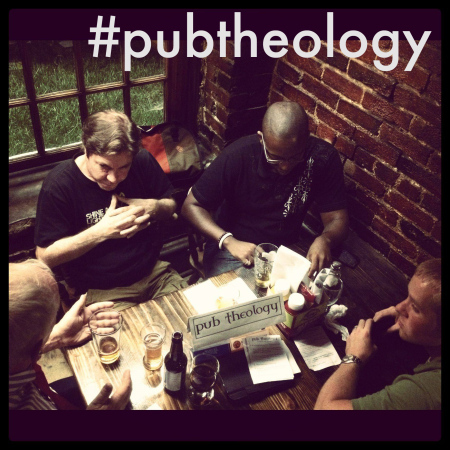 I would love to be a part of a Pub Theology group! Guess I might need to get your book and start one? Thanks, Bob! The book might be a good starting point. I’m also releasing a new ebook, hopefully before the end of the month, that is a good complement to the first one, plus a great resource for ongoing conversation topics. Cheers! My husband & I are coming to DC on March 7-12. I would love to come to the pub meeting, not sure it will fit in our schedule though. We will be staying in that area, any church suggestions? Glad to hear you’re coming to DC. Unfortunately I’m won’t be at the Pub Theology gathering that night – but it will still be happening! As for churches, you’d be welcome to visit ours: Roots DC (rootsdc.org). Otherwise I’d recommend The District Church or any number of other good options, depending on what you’re looking for. Thanks for the suggestions! We’ll be staying in the Woodley Park area so I’ll try to get over to Roots. I grew up in Holland, Michigan(Reformed Church) so your story fascinates me. Thoughts on life and faith, over a pint. Bryan Berghoef is a pastor, speaker, and author of the book: Pub Theology: Beer, Conversation and God. He's also a big fan of his kids, baseball, and a good scotch.